(Tenero, Switzerland)- Twenty-one Swiss sailing clubs sailed their first ever Swiss Sailing League Youth Cup on Lago Maggiore. The host was the Locarno Yacht Club together with the Tenero National Youth Sport Center (CST). The teams sailed with a crew of five teenagers on the matched fleet of J/70 one-design sailboats. 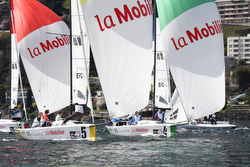 In dreamlike conditions, the Swiss Sailing League Youth Cup was launched on Lake Maggiore. With southerly winds of 8-12 kts, the fleet enjoyed nine races on the first day racing. After the first day of the regatta, the Bielersee YC was leading the fleet by just one point ahead of the Regattaclub Oberhofen, 3rd place was the Zurich Sailing Club. In excellent wind conditions, the fleet had a great set of races on the last day of the competition. 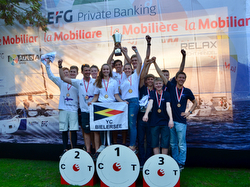 With five victories and a second place, the YC Bielersee won the regatta; their team included Damian Suri, Alissia Mueller, Chantal Suri, Léo Chassot and Florian Geissbühler. Taking second was the Zurich YC team led by skipper Lukas Looser and third place went to Regattaclub Oberhofen with helmsman Nick Zeltner. For more Swiss J/70 Sailing League information Add to Flipboard Magazine.